Thanks to all who attended our June 15th event. We encourage you to participate in this next exciting event as we launch our new chapter. Please forward this invitation to friends and colleagues who would find our organization and this event of interest! On September 21, Authors Raj Sisodia and Nilima Bhat will explore their recent book in a workshop/book signing event. Our current one-sided notion of a leader’s power is the root cause of a host of contemporary problems, including social breakdown, environmental degradation, an epidemic of depression, and corruption in business and government. Whether we are male, female or transgender, we have been trained to value leadership qualities that are traditionally thought of as masculine: hierarchical, individualistic, militaristic. 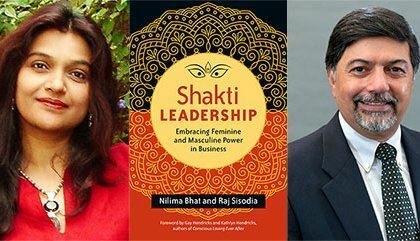 Reaching into ancient spiritual and mythical teachings, Nilima Bhat and Raj Sisodia revive the feminine archetype of leadership: generative, cooperative, creative, empathetic. In the Indian yogic tradition, these qualities are associated with Shakti, the source of creation, sustenance and transformation that powers the cycle of life. The authors seek to restore a long-lost balance, for all genders alike, of masculine and feminine energies. All leaders should learn to value and understand ‘Shakti Leadership’ – acting from a consciousness of life-giving creativity and sustainability to achieve self-mastery and be of selfless service. When leaders of all sexes learn to embrace this mind-set, we can restore sanity, elevate humanity and heal the planet by evolving consciously together. John Kluge's review of the book on Forbes.com, offers that "Bhat and Sisodia lay out simple and practical steps for readers who might begin this journey." Join us and advance your own journey. Please note that you will be able to pre-order books at $15 each prior to the event. We will deliver them to you at the event and you can ask the authors to sign them.